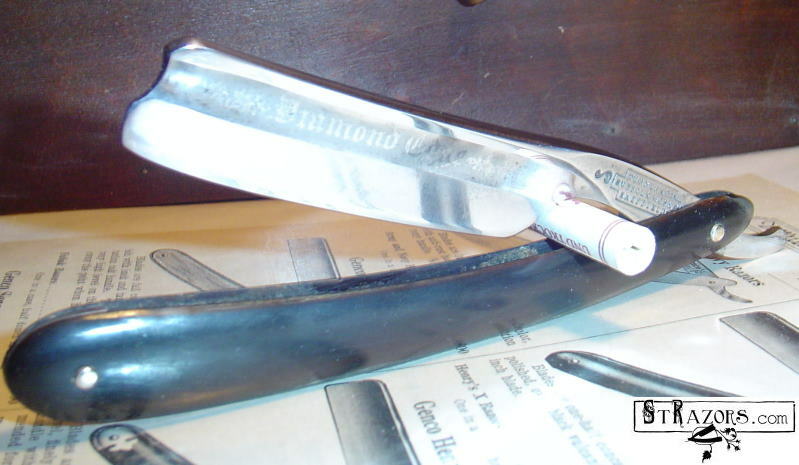 STRAZORS.com - all about classic razors - Thomas Turner & Co., Sheffield. 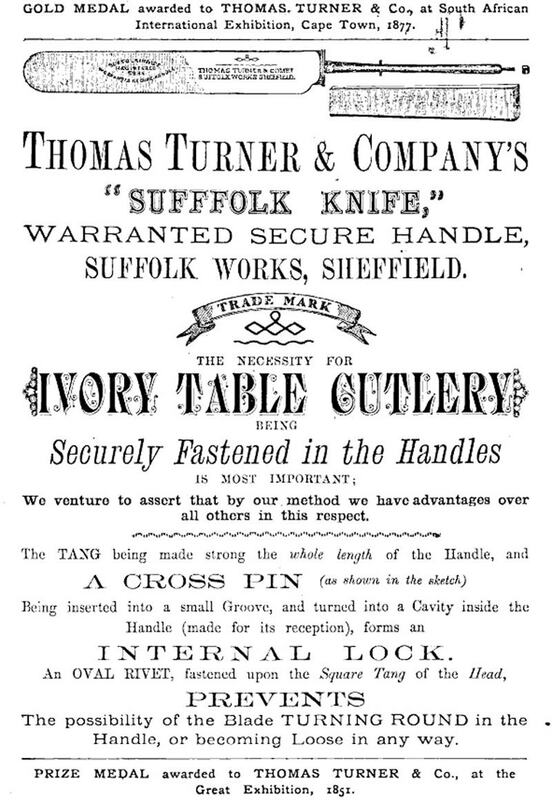 By the end of the 19th century, Turner's was one of the most important cutlery firms in Sheffield. The company stated that the business was founded in 1802, though it provided no details. By 1822, it was listed in a Sheffield directory in Norfolk Street, though another business - Thorpe,Turner & Co. - may have been a predecessor. Like Marsh Bros, the company mixed steel and tool manufacture with cutlery, and also operated as a merchant. The owner was Thomas Turner, living at East Bank. After he died on 5 March 1845, aged 61, the business passed to his eldest son, also named Thomas. The latter had been born on 10 January 1829 and educated in Dronfield. His brothers, Benjamin Thorne and William Thorne Turner, also became partners. By the 1850s, the company's reputation was secure. In 1851, it won a Prize Medal at the Great Exhibition. Sometimes Turner stamped several slogans on each knife. Aside from the slogans, Turner's used the trade mark "ENCORE"(granted in 1805). In the 1860s, Turner's brothers - Benjamin and William - withdrew from the business. Their place was taken by Joshua Smith. In 1871, Thomas Turner had informed the Census that the business employed 500; but when the Census was taken again in 1881 it was Smith (and not Thomas Turner) who told the enumerators how many workers the factory employed: 244 men, 24 women, 7 girls, and 12 boys (387 workers). Perhaps Thomas was spending less time at the office. Joshua Smith died on 23 April 1887, aged 71. He had been a partner at Turner's until 1884. Turner became Master Cutler in 1871, and also served as a Town Councillor. He was a Liberal and keen temperance supporter. He had brought his only son, Thomas Turner Jun. into the firm. But the latter died on 27 March 1886, aged 31, which ruined any hopes of a family succession. Turner himself retired in 1893 and devoted his time to gardening. He could afford to do so. He died on 18 March 1916, aged 87. In 1893, Turner's had been sold to (Sir)Albert Hobson and brother Wilfred (both formerly of Joseph Hobson & Co.). In the following year, Turner's registered a silver mark in Sheffield (others had been registered in 1865 and 1884). The firm then employed about 300. The firm's centenary was in 1902 - the year that Albert Hobson became Master Cutler - and the company decided to publish an anniversary pamphlet, Handicrafts that Survive, which unashamedly celebrated the old crafts. 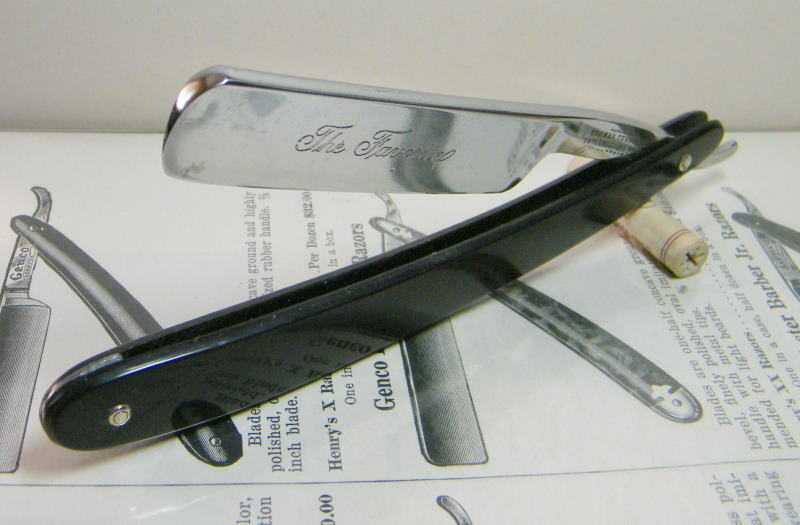 In 1914, Turner's apparently employed about 800 in the manufacture of crucible steel, saws, files, table and pocket cutlery, scissors, razors, edge tools and electro-plate. Turner's became a limited liability company in 1918, partly because Hobson's two sons had been killed in the war and were therefore unable to inherit the business. In the following year, it became part of Sheffield Cutlery Manufacturers Ltd, an amalgamation led by Needham, Veall & Tyzack. A.J. Hobson was knighted in 1922. When he died on 20 April 1923, aged 62, at his home Esholt, Ranmoor, the newspapers devoted three print columns to his life. Turner's did not long survive his passing or the depression: in 1932 the bankrupt business was bought by Viners.